CNN's Republican debate in Miami averaged 11.9 million viewers on Thursday night, more than double the audience for the Democratic debate earlier in the week. The GOP debate was a relatively subdued affair, which may have had a subduing effect on the ratings. 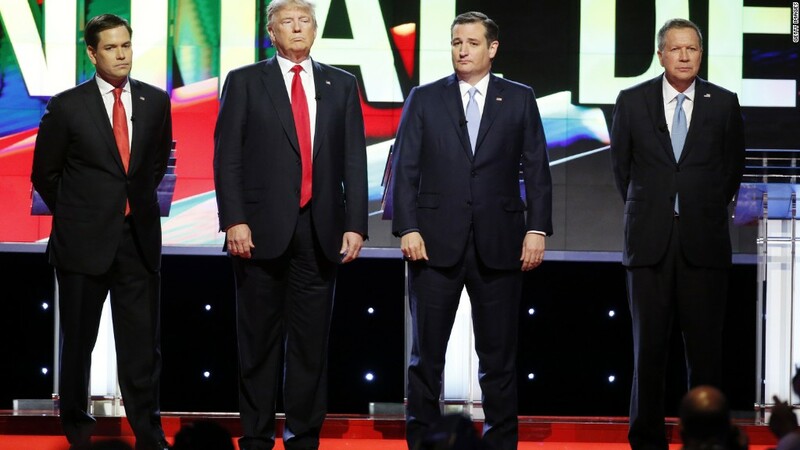 A much rowdier GOP debate last week, televised by Fox News, had 16.8 million viewers. That was the highest total since December, when CNN had 18 million viewers for a debate in Las Vegas. CNN's most recent Republican face-off, held in late February in conjunction with Telemundo, had 14.5 million viewers. Donald Trump and his GOP rivals continue to be much stronger ratings draws than Hillary Clinton and Bernie Sanders. The Democratic debate broadcast by Univision earlier this week, simulcast by CNN, had a combined 5.5 million viewers. On Thursday night CNN averaged 3.67 million viewers ages 25 to 54, the key demographic for cable news advertisers. "This represents the third highest debate of the year in the demo 25-54," CNN said in a press release. This season's GOP debates, fueled by Trump, have smashed prior viewership records, resetting expectations for how high debates can rate. Fox's very first debate of the season, featuring Trump's now-famous clash with co-moderator Megyn Kelly on August 6, 2015, attracted 24 million viewers, an astonishingly high total.